← Declassified documents expose US support for ISIS and nobody cares! The following article was officially co-authored by Professor Tim Anderson and myself (though it was largely Tim’s work with some tweaking from me). Tim and I were together in Syria for the latter part of July though we had come with slightly different agendas. He and his team were focused on visiting hospitals and humanitarian work. Jake Najjar and I were boxing with young people and working with the Sports Federation. Even so, together we all made a great team. The surprising thing about this article is that none of the major papers we approached would publish it! It is hardly a radical piece and yet it seems that most mainline media are currently too scared to publish anything that departs from the government-endorsed narrative! That narrative insists that Syria is in its death throes and that we’ll be doing the Syrian people a favour if we start bombing ISIS for them and force a change of government while we’re at it! This is NOT the sort of help the Syrian people are looking for. 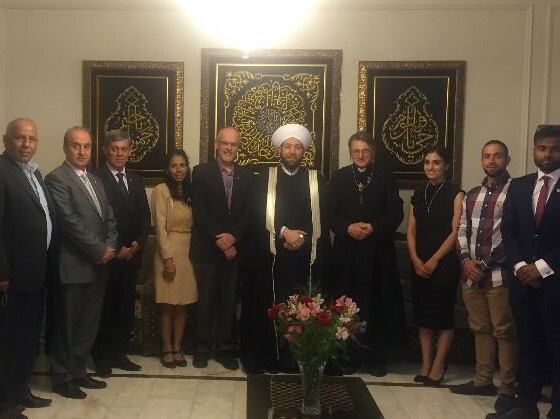 Our visit to war-torn Syria, last month, reinforced our belief that the Syrian people need our friendship and direct person-to-person contact, rather than any contribution to the further violence through participation in a ‘regime change’ operation. We have visited Syria several times during the crisis, as guests of both government agencies and religious and higher education groups. We always pay our own way to Syria. Last month we were hosted by the Syrian Institute of Sport, allowing us to visit sports facilities and hundreds of young people in Damascus, Tartus and Latakia. We also contributed funds to hospitals and relief agencies in Damascus and Sweida and met with government and religious leaders. We saw thousands of young people engaged in Syria’s very large sports facilities, including numerous disabled athletes who were participating in a Special Olympics. We visited art schools and saw a functioning and caring health system – despite the ‘rebel’ attacks on so many of Syria’s hospitals. We know that there are millions of Syrian children attending school and hundreds of thousands in their large (and mostly fee-free) universities. In short, despite the war, a functioning state ensures that everyday life goes on, though it can hardly be called ‘normal’. Every family is losing loved ones in this bloody conflict. Army checkpoints are frequent and rigorous, with queues of Syrians showing remarkable patience. They know the military presence benefits everyone’s security. There is often a cordial exchange at the checkpoints; Syrians do not view the soldiers with fear; most have family members in the army or in one of the various army-linked militia. These are prominent in Sweida, Latakia, the Kurdish areas and Yarmouk, a southern suburb of Damascus which once housed 150,000 Palestinians. The Palestinians from Yarmouk are now dispersed in various parts of Damascus, as with most other displaced people in and around the capital. We visited one group at a school on the outskirts of Yarmouk, distributing boxing equipment and soccer balls to the children, and passing on some much-needed cash to the families. That ‘camp’, and the entire perimeter of Yarmouk, is controlled by the Syrian Army which only allows the Palestinian militia loyal to Syria to enter this zone, which still has elements of ISIS and Jabhat al Nusra, and whose population has shrunk to less than 10% its former size. In the north, the Mayor of Latakia told us that the population of that province has shot up from 1.3 million to three million. Displaced people from Aleppo, Idlib and other northern areas affected by the incursions of Takfiri groups (sectarian terrorists streaming in from Turkey) are housed throughout the province. Only one percent of those people are housed in institutions such as Latakia’s large sports centre. Most are in free or cheap government housing, with family and friends, renting or in small businesses. Unemployment, shortages and power blackouts plague the country. The ‘rebels’ regularly attack power plants. In the south, Sweida has been hosting 130,000 displaced families from the Daraa area, doubling the population of that province. Damascus holds the greater part of the 5 or 6 million internally displaced people, and the government and army organise their care. Syrians tend to refer to all the armed groups as just Daesh (the Arabic acronym for ISIS) or ‘mercenaries’, making little distinction between their various brand names. All The Muslim Brotherhood backed groups (‘moderate rebels’), the Islamic Front, Jabhat al Nusra and Daesh all have the same sectarian ideology, seem to share the mostly US supplied weapons, and alternately cooperate and squabble amongst each. They all commit similar atrocities, often blaming them on the Syrian Army. Despite the recent Islamist offensives in Idlib, Daraa and Palmyra, the security situation in most populated areas remains firmly in the hands of the Syrian Army. We were able to travel from Sweida in the south to Homs, Tartus and Latakia in the north, with only one small security-related detour. That was not possible 18 months ago. Armed groups do have a presence in much of the country but, contrary to many western reports, probably control less than 10% of the populated areas. They are embedded in the northern parts of Aleppo and the eastern parts of Damascus, wreaking havoc by sniping, mortaring and car bombs, but generally gaining no new ground. The fact that Syrian planes and artillery have not flattened these hold-out areas gives the lie to the claim that the Syrian Army carries out indiscriminate attacks. The war is being fought on the ground, building to building, and with many army casualties. We visited some of these soldiers in hospital, in 2013 and again last month. These are the victims the western media ignores. Many Syrians we spoke to said they wished the government would flatten ghost towns like Jobar, Douma and North Aleppo, saying that the only civilians left there after two or three years are the families of and collaborators with the extremist groups. After more than four years of foreign backed terrorism, often wrongly called ‘civil war’, it should be clear that overthrow of the Syrian government will not happen unless the US initiates some massive new escalation. We have to believe that a diplomatic solution is not only possible but far less costly. Is it too much to hope that the Australian Government could take some independent steps to normalise relations, without waiting for Washington’s permission? Australia could re-establish normal diplomatic relations, abandon the war propaganda, drop the economic sanctions that only harm civilians who are already struggling, and normalise economic and social exchange. Father David Smith is a Sydney-based Anglican Parish Priest. Dr Tim Anderson is a Senior lecturer in Political Economy at the University of Sydney. This entry was posted in Article, syria news, syrian civil war and tagged Australian Government, Father Dave, ISIS, Professor Tim Anderson, Sports Federation, syria, syrian army, Yarmouk. Bookmark the permalink. Why is Australian Msm NOT reporting this? Surely preventing another costly human tragedy like Iraq wud be GLOBALLY BENEFICIAL?? ARE OUR GOVERNMENTS deliberately playing into Armament Corporations greedy.blood soaked hands for their profit? We can’t allow this to happen? We were told that the whole Q&A drama has left Australian publishers scared of departing from the official narrative. Our message – that Syria doesn’t need more violence – is apparently just too dangerous and destabilising for publication! Thank you for this article god bless you. Terrible. May the truth come out soon. This depends upon the awakening of the populations of teh various countries. Internet is the last freedom. One of the only premises preventing people from waking up is disbelief based on an erroneous belief that governments and mainstream media wouldn’t lie and deceive to such a murderous extent as they have. Such disbelief becomes the inadvertent ally of evil (for a lack of a better word). If you cannot speak, you cannot think. If you cannot think, you cannot figure things out. If you cannot figure things out, you will never see that you are a slave. If you cannot see that you are a slave, you can never rebel. If you cannot rebel, you will never be free. If you cannot be free, you can never fulfill your purpose on earth to be your highest and best self.